Deco clock radio, fully restored; all original with complete rebuild of all necessary electrics, capacitors, tubes, etc. Clock cleaned and works excellent and is very quiet, all functions work. 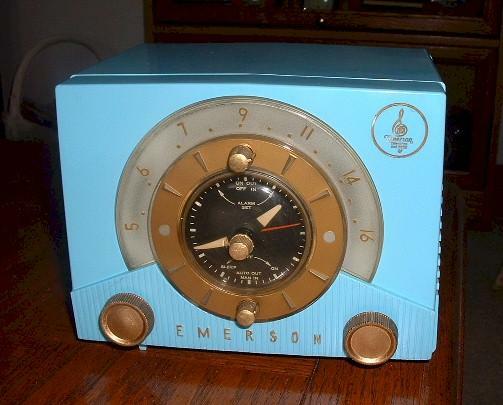 A seldom seen radio in this beautiful robin's egg blue case with gold accents with no cracks, chips or cabinet repairs. Plastic dial cover has a few minute bites and one small indent only visible on close inspection. You are visitor number 3,863 to this page.